Years after murdering her neighbour under the guise of driving drunk, Valerie Walker (Sheila McCarthy) returns home from prison. She plans on moving on without revisiting any of the events she has had years to ponder, but the deceased man’s son Mark (Noah Reid) soon shows up at Valerie’s door. He comes for closure but makes his suspicions about Valerie’s motives crystal clear, as he does his intention to dig until he hits the core. Exasperated, Valerie needs to keep at bay past witnesses, an inquisitive therapist, and a creeping Mark, all while protecting her family. 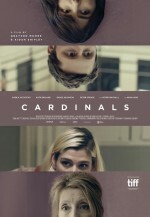 Produced as part of Telefilm’s Micro-Budget Production Program, Cardinals was filmed in Stratford, Kitchener, and Barrie, Ontario.